When it comes to compact SUVs, many make sporty performance or premium luxury top priorities, while utility takes a backseat. The 2017 RAV4 is an energetic crossover with plenty of interior comforts, undoubtedly, but it maximizes efficiency with ample cargo room, cost-cutting mpg ratings, and optional all-wheel drive. Santa Ana and Culver City families are sure to feel right at home inside its five-passenger cabin. Look below to learn more about the Toyota RAV4 SUV’s utility! Behind the second-row seats, you’ll find 38.4 cubic feet of storage. Folding the 60/40-split rear seats down reveals up to 73.4 cubic feet—impressive for a compact SUV. The available cargo net hammock is ultra-flexible and simplifies storing and transporting shoes, sleeping bags, gym bags, small coolers, and more. The handy 60/40-split folding rear seats not only expand the cargo area, they also let you transport larger, more awkward items and a rear passenger. For optimal traction, the available All-Wheel Drive System with Dynamic Torque Control allocates torque to the front and rear wheels, based on driving conditions. The 2017 Toyota RAV4 SUV’s utility begins under the hood. Offered in LE, XLE, SE, Limited, and Platinum trim levels, the RAV4 is powered by a 176-hp 2.5L 4-cylinder engine and 6-speed automatic transmission. Properly equipped, the new RAV4 can tow up to 1,500 pounds—perfect for families who frequent Manhattan Beach and nearby vacation hotspots. 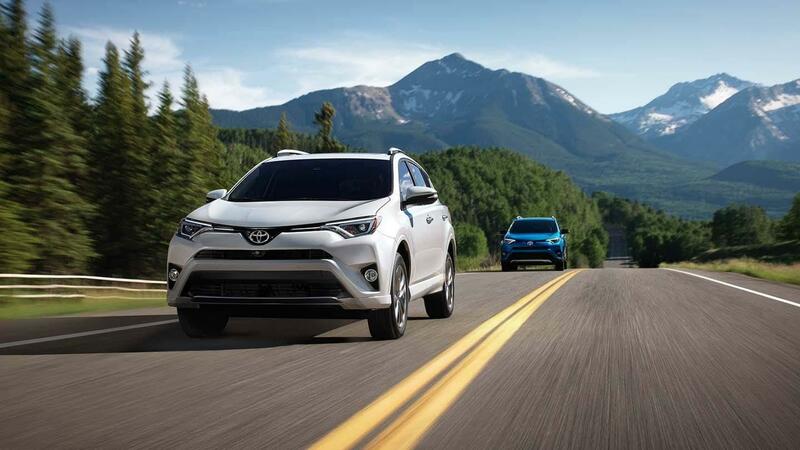 The RAV4 also earns a maximum EPA-estimated 23 mpg city/30 mpg highway rating, which equals more time spent enjoying the open road and less time searching for a gas pump. The cabin offers a variety of storage mediums for books, CDs, and more. Inside, you’ll find a center armrest with a console storage box for your phone and meter fare, as well eight beverage holders. The door panels include handy storage pockets, while the overhead console lets you safely tuck your sunglasses away. Three 12-volt power outlets—two in the front and one in the back—ensure your devices stay charged on the go. The higher trims can be upgraded with a height-adjustable power liftgate, giving you quick, hands-free access to your belongings. The 2017 Toyota RAV4 SUV’s utility is even more impressive in person; contact Marina del Rey Toyota to schedule a test drive near Santa Ana! Our team of experts will guide you through the sales and financing process step by step!